In order to maintain the purity of Yoga, this article has been slightly edited by extracting only the sections that pertain to Raja Yoga meditation. Here are the best excerpts about meditation and what it can do for you. 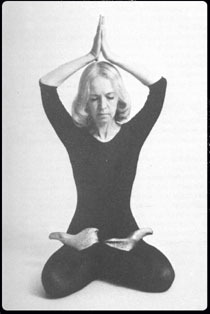 This beautiful image of my teacher, Eugenia, shows how even while doing a Yoga movement, one can be in a state of meditation. According to Yoga philosophy, the most spiritual and powerful aspect of man's nature is the faculty of attention or consciousness. The most fundamental aspect of man's free will is the choice as to what he allows his attention to dwell upon. The attention always has to be on something, but we can choose what we allow it to dwell upon. It should be constantly remembered that whatever perceptions, thoughts and even visions that occur are all the creations of one's own mind and consciousness, and are filtered through one's own instrument of perception. These perceptions are patterns of our own psychic energy. We give energy to whatever thoughts and feelings we allow the attention to dwell upon. Wherever the power of attention is focused, it generates mental and emotional energy in the form of its own lower overtones, thus feeding and energizing the thoughts and emotions which the attention dwells upon. It becomes clear that the key to remaining in control of a meditative experience is in controlling the flow of attention. Distractive experiences can be avoided in the first place, and the flow of attention can be properly directed by the use of Raja Yoga techniques of meditation. The following is a description of several such techniques which can all be applied. Realize that whatever you may be thinking, feeling or experiencing is being experienced by the consciousness within you. Then place your undivided attention on that consciousness which is experiencing whatever is happening to you. This process returns your consciousness to its own pure nature and disengages mental and astral thought forms. Destructive thought forms then dissipate and are dissolved back into the homogeneous, vibrational energy of the plane of energy substance from which they were originally molded. The strong light released by consciousness observing itself, helps to quickly dissolve and dissipate destructive thought forms. This happens because the strong lower overtones of pure consciousness which are generated, cancel out the discordant, out-of-phase vibrations of destructive thought forms. If the attention wanders while practicing any of these meditation techniques, immediately bring the attention back to the process of meditation, and do this as many times as is necessary until the attention remains centered on the particular form of meditation which you are practicing. Inexperienced meditators have a tendency to fight distractions, which in itself, becomes a distraction. The attention can only dwell on one thing at a time. Simply bring it back to the what you are meditating on. Focus your full, undivided attention in the center of your brain where the pineal gland is located. Look in an anatomy book to locate it. It helps the visualization a lot. Listen with your attention for whatever sounds present themselves. After a while, you will hear sounds of various tones and pitches. At first, you may only hear the low hiss of random molecular noise in the ears, but in time, definite tones will present themselves like sustained notes on an organ. This sound is perceived directly by the brain and the subtle bodies themselves, and not through the outer physical organs of the ears. It is the sound of the vibration of conscious energy as it flows through the physical body and as it vibrates and circulates within the subtle bodies. You should focus your entire undivided attention on the sound of the highest pitch that you can hear, and let it draw you up into higher and higher states of consciousness; also let the sound reveal and intensify the spiritual light. The better your concentration is, the louder and more distinct the sound will become. Experience the vibration of this sound expanding until it includes your whole head, your whole body, and ever-expanding volumes of space surrounding you. By doing this, you will tune into the music of the spheres, and your whole being will become a receiver and transmitter of the harmonious rhythm of the universe. When you open your eyes after such a meditation, you may find your surroundings filled with blazing light. In the beginning, the sound current may appear in one localized part of the head; most likely in one of the ears. You should not listen to the sound current in the left ear because this is psychically harmful. Listen to it in the right ear, and gradually try to move it to the center and top of the brain. From this vertex center, known as the Sahasraram Chakra (whose associated gland is the pineal body), allow the vibration of the sound current to fill the entire head and to then expand beyond the head into the surrounding space. This is one of the classical methods and can lead to the highest type of experience.